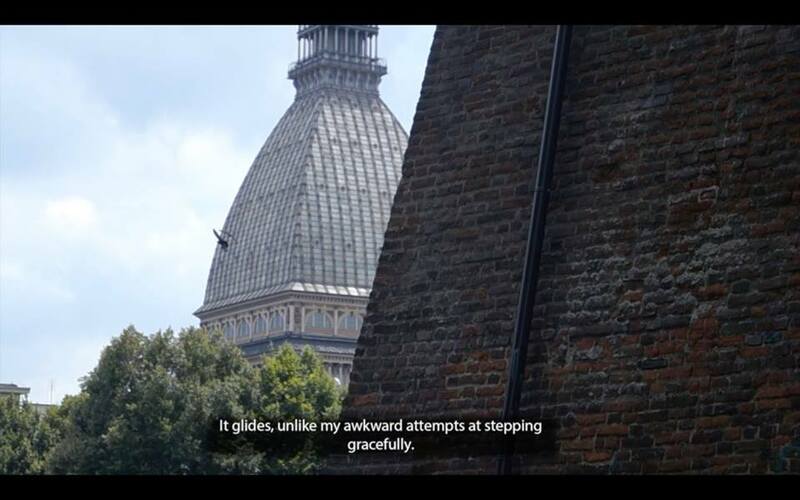 The video takes Mole Antonelliana as the main protagonist, and sets up a loose first-person narrative about surveillance; resulting in a humorous account whereby any coherent reference to time and space collapses. Ways of seeing and ideas of perception extend to the way the footage has been shot and edited. Adopting crude stop motion the work speaks about the performative aspect of images, as well as inquiring into how reality is represented and meaning can be constructed or altered. La la sets up La Mole not only as a coercive structure but enters into a dialogue with the history of the moving image of the Museo Nazionale del Cinema in which it houses. Working across a scope of discursive and formal mediums including spatial practices, video and performance, Silvi Kadillari’s practice delves into both personal and shared experiences; drawing from sites, histories and bodies.